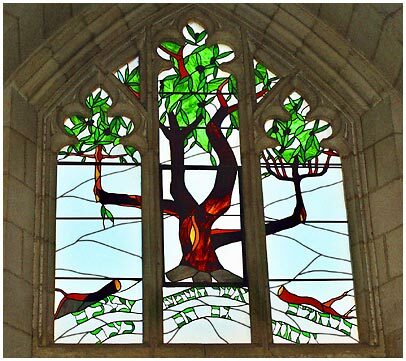 The artfully designed church window pictures an olive tree including a mysterious message. Beneath the tree roots you see two broken-off branches which are connected by Hebrew characters. You can read: "Ba rachamim asher ha shemesh alechem, yerachamu gam hem ke'at." Translated into English, this means approximately: "By the mercy of God who makes the sun shine above you, lovingness will be given to you in our days." Several biblical prophets, as well as King David, compared the Jewish people with an olive tree. So these comforting words are directed towards the people of Israel. Because of its painful history, it often felt abandoned by God and it resembles the cut-off branches lying on the ground seemingly without hope. It is worthwhile to have a closer look at this extraordinary tree and to reflect on it. The longer you view it, the more wondrous details you will detect. The twigs and leaves are densifying to the top as they are striving to heaven, towards the light. From one bough however, which is also the lowest one of the tree, there are six branches arising, three to the right and three to the left side. This is an indication to the seven-branched lampstand (in Hebrew 'Menorah') which once stood in the sanctum of the tabernacle and later in the temple at Jerusalem. The seven lamps of the golden candelabra were at that time feeded by pure olive oil and had to light the sanctum day and night (2. Mose 25, 37). Till this day, the menorah is considered being a symbol for the renewal of Jewish life in the land of Israel. It is striking that only the upper branches are dressed in a mellow green colour through which some single olives are shimmering. The strong dark-brown branches beneath however appear bare and desolate. The sad impression is yet intensified by the two branches lying on the ground. As they are lying there, they are useless: they do not produce any fruit, not a single leaf is pullulating. They seem to be cut off in order to wait until the day when they will return to the tree. The olive tree is nourished from the deep ground, where the strong roots absorb nutrients and pass them through the trunk to all branches and twigs. But how can the two cut-off branches  having no connection to the root  return to life? They are lying noticeably close to the words quotated at the beginning. Well, it seems as if they would be solely carried by the promise "By the mercy of God who makes the sun shine above you, lovingness will be given to you in our days". The artist speaks to the attentive viewer by his symbolical colouring. Surely it is no coincidence that the leaves are steeped in the same mellow green colour which makes the Hebrew letters shine. This stands for the liveliness and the fruitful truth of the promise of God's mercy upon Israel. Also the cut surfaces of the two branches on the ground provide an indication by their intense yellow colour: We find a similiar tone in the hole at the left side of the bole, apparently emphasizing the mysterious connection of the two cut-off branches with the trunk. It is remarkable too that not only the tree but also the roots and the ground are surrounded by a pleasant pale-blue shimmering light. As if the artist would say: "What eludes the human eye because of lying in the dark is for the Almighty a bright space in which He is constantly operating." It reminds me of Psalm 139, 11-12: "If I say, Surely the darkness shall cover me, even the night shall be light around me. Yes, the darkness does not hide from You; but the night shines as the day; as is the darkness, so is the light to You." Hosea 14, 4-7 The Lord speaks about Israel: "I will heal their backslidings; I will love them freely; for My anger has turned away from him. I will be as the dew to Israel; he shall grow as the lily and cast out his roots like Lebanon. His branches shall spread, and his beauty shall be as the olive tree, and his smell as Lebanon. They who dwell under his shadow shall return; they shall revive like the grain, and grow like the vine. Their scent shall be as the wine of Lebanon." Psalm 52, 8-9 A Psalm of David: "But I am like a green olive tree in the house of God; I trust in the mercy of God forever and ever. I will praise You forever, because You have done it ; and I will wait on Your name; for it is good before Your saints." Romans 11, 16. 28b-29 For if the firstfruit (this means Abraham and the other progenitors) is holy, the lump (the descendants) is also holy; and if the root of the olive tree is holy, also the branches (v. 16). As regards the election, they are beloved for the fathers' sakes. For the free gifts and calling of God are without repentance (v. 28b, 29). All contents, images, texts, music, video and graphic files are protected by copyright. Without the author's prior written consent they may not  neither completely nor partly  be copied, modified, multiplied or published. You are explicitly permitted to download PDF files and CD cover pictures which are provided on this website.